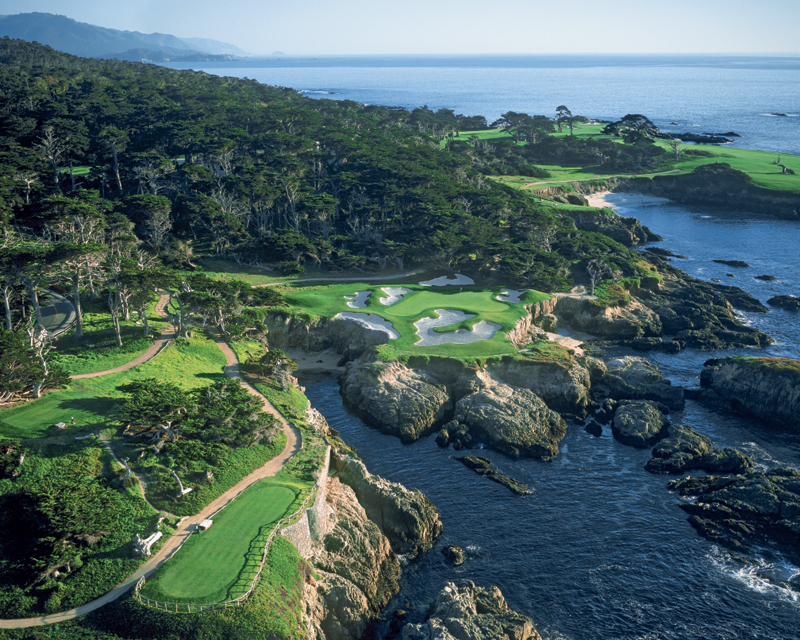 A near-perfect collaboration between the greatest golf architect of all time and the finest piece of golfing ground yet discovered, the Cypress Point Club is situated on the westernmost tip of California’s Monterey Peninsula and first opened for play in 1928. The course was the vision of champion golfer Marion Hollins, who convinced Del Monte developer Samuel Morse of the need to establish a private club within his subdivision, as an alternative to the more accessible golf available on the Peninsula. 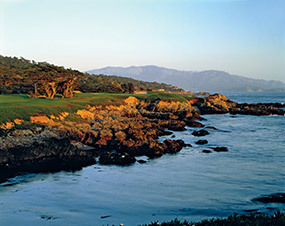 Hollins had identified an ideal stretch of coastline for the club and hired Seth Raynor as its course designer. When Raynor passed away prior to construction commencing, she appointed Dr Alister MacKenzie as his replacement. It was an inspired decision. With its dramatic seaside cliffs, large coastal dunes and almost-mythical pines and cypress trees, MacKenzie fell instantly for the property and spent a great deal of time ensuring his routing fully exploited the natural bounties available. Ignoring all perceived golfing conventions, the layout is neither arranged in a large out and back loop nor with its nines returning to the clubhouse. Instead it starts on open ground and finishes with an extraordinary sequence of holes along the Pacific, in between moving effortlessly between the dense woodlands and spacious dunes. The sequence of holes is also unusual with consecutive par fives on the outward nine and consecutive threes toward the close. Aside from this bold routing, what makes MacKenzie’s work here so incredible is the strategic arrangement of his holes, the sublime green settings, creative putting contours and the naturalistic style of bunkering, the sprawling traps artistically shaped to appear part of the virgin landscape. To the surprise of those who think Cypress Point’s appeal is solely due to the ocean holes, the quality of the earlier golf is quite extraordinary. The 8th and 9th, for instance, are among the finest back-to-back par fours in America, both rewarding accurate driving but each with ideal landing areas that are increasingly difficult to hit the more club you take from the tee. The 8th is played across the shoulder of a large sandhill to a fairway leaning away from the green; those able to hug its dangerous right side are given the best line into a remarkable multi-tiered target with four or five distinct pinable shelves. The 9th is then a brilliant drivable par four, its fairway dropping along a narrowing ridge toward a terrifying green that is benched into a sizeable dune, angled across the approaching golfer and squeezed between some of the most formidable traps on the course. Other special holes include the strategically bunkered par fives, the cross-valley par three 7th and the perfectly proportioned dogleg 12th. Also unforgettable is the mid-length 13th, its putting surface cut into a dune and surrounded by some of the most magnificent bunker shapes ever constructed by man. As memorable as these holes may be, they are but a mere prelude to the closing section and the sheer exhilaration one feels when stepping onto the 15th tee for the very first time. After crossing Seventeen-Mile Drive the golfer emerges from a cypress grove to be presented with a coastal golfing scene of almost inconceivable beauty, the hole itself requiring little more than a short-iron but the exquisitely bunkered green is positioned atop a rocky bluff and beyond a violent ocean cove. The visual splendour of this gem would be unsurpassed in golf were it not for the very next hole, the 16th regarded almost universally as the most spectacular par three on the planet. Again the golfer heads directly across the Pacific, this time needing to carry at least 220 yards in order to reach a target perched on a distant promontory. This unforgettable hole was actually suggested by Marion Hollins, but what makes it so impressive is the fairway area to the left that MacKenzie insisted on including to allow nervous players to approach it as a strategic short par four. Completing a three-hole stretch unrivalled anywhere on earth is a cape-style par four that heads across and then along the craggy shoreline. Set obliquely to the tee, the fairway here is dominated by a central clump of cypress trees, which forces you to flirt with the water in order to setup an optimum view of the green. Steering players away from the sea, the 18th is a much-maligned finisher that zigzags up a narrow fairway and back to the elevated clubhouse. Though the hole is overcrowded by trees, those able to safely find the short grass with their drive are left with a lovely approach shot into a putting target pitched steeply from back-to-front. Like many clubs of this vintage, Cypress Point has undergone periods of neglect but a recent restoration program has successfully returned the greens and bunkers to near their original proportions. The club has also consciously tried to expose more of the native sand and return holes to the rugged appearance that the designer had so desired. Understandably, MacKenzie took enormous delight in the success of Cypress Point and the pleasure it brought people from across the golfing spectrum. About the only disappointment he might have with how the club has evolved, is that it is has become so exclusive few visitors ever get to experience his masterpiece. Regardless, this is a layout that truly has it all, great architecture, a great setting, incredible sand dunes and the finest stretch of holes anywhere on the planet. 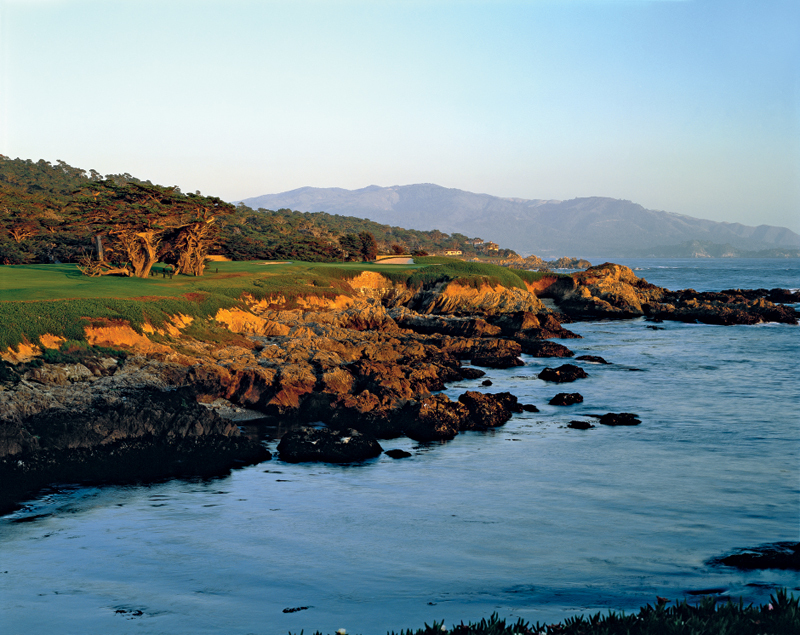 Although there have been numerous coastal sites uncovered since the course was built, the sad truth for global golfers is that there is still only one Cypress Point.